Saruni Samburu is surrounded by 240,000 acres of the private Kalama Wildlife Conservancy. From its mountain top location you'll have spectacular 360 degree breath-taking degree views. The lodge is a feat of architectural skill. As well as exciting safaris you'll have time to get to know your Samburu guides, gaining an insight into the traditions, history and culture of these people. There are six spacious villas offering self-contained, en-suite accommodation, with large viewing decks making the most of the wonderful views. Four of the villas have two en-suite bedrooms making them ideal for families or groups of friends. You can take game drives in the Kalama Conservancy and Samburu National Reserve, for varied wildlife viewing. There is a high density of leopard, a large population of the endangered Grevy zebra, and all the Northern species such as reticulated giraffe, greater and lesser kudu, gerenuk, oryx are abundant. Nature walks, bush dinners, viewing rock art, trekking up Mount Ololokwe and visiting Samburu communities are also available. Saruni Samburu offers a Warriors Academy programme, where guests of all ages can learn to track animals and craft tools in Samburu style. Relaxing at the lodge you'll be able to take advantage of the facilities which include two large swimming pools and the Samburu Wellbeing Space for massage and spa treatments. Meals at Saruni Samburu have a strong Italian influence, so you'll be treated to tasty risottos and pasta dishes as well as local specialities. You'll have the choice of dining with other guests and the lodge hosts, or in your own villa. Location: Kalama Community Wildlife Conservancy, 7km north of Samburu National Reserve. The nearest airstrip is Kalama, a 40 minute drive from the lodge. The lodge is a 5-6 hour drive from Nairobi. Rooms: Saruni has just 6 villas. 2 of the villas have 1 en-suite bedroom each, 2 are family villas with 2 en-suite bedrooms each, and the other 2 each have 2 en-suite bedrooms that can be booked separately or togther as family accommodation. Every villa has a sitting area and a private terrace. Facilities include a fridge stocked with cold drinks, safe, hairdryer, organic toiletries and bathrobes. They are at varying distances from the Kudu House, the main lodge. Activities: Safaris by vehicle or on foot, and wildlife viewing and photography from a hide by the waterhole. The Warriors Academy programme is a family safari with a strong educational component (special courses in bush skills, animal tracking and guiding). You can visit the caves to see Samburu rock art, go birdwatching, and energetic guests can accommpany a guide on a trek up Mount Ololokwe, a mountain sacred to the Samburu people. Helicopter and bi-plane flights can be arranged on request, at extra charge. Bush meals and sundowners are popular. Facilities: There are 2 infinity pools, 1 at the highest spot in the grounds, and a spa, the Samburu Wellbeing Space. Kudu House is the social centre of the lodge, with a lounge and dining area set beneath a thatched roof, and open to the front for optimal views. Thge shop stocks locally made handicrafts. Dining: Communal dining with your hosts is encouraged but private dining can be arranged if you prefer. The meals have a strong Italian influence. There are indoor and outdoor eating areas. Children: Saruni Samburu welcomes children of all ages, and children must be kept under supervision at all times. The larger villas make great family accommodation. the Warriors Accademy programme is designed for families. Health: Malaria risk here is minimal, but other parts of Kenya do have a much higher risk so precautions should be taken. Communication: There is free Wi-Fi inrternet access in social areas, and a good phone signal. Saruni Samburu works together with the Northern Rangeland Trust to improve the life conditions for the 2,000 people who own the Kalama Conservation Area, and is providing them with income generated by tourism for the first time in their history. The lodge will eventually be owned by the community and operated by Saruni on a commercial basis. Saruni Samburu is committed to employing most of the staff from this small and impoverished community. 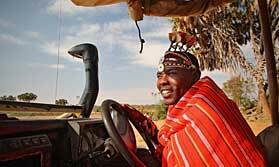 At least 90% of the employees are local Samburu men and women and trained by the lodge. The lodge has been built to achieve minimum impact on the environment. Saruni Samburu are providing the Kiltiman Primary School with a new water tank and sponsoring one of their best students for further studies. They are also paying the salaries of 2 Kalama rangers to help the community. "Amazing place, if somewhat remote. But that meant game drives/walks in the private conservancy were brilliant. Swimming pool was appreciated. Our guides were fantastic." "Wow! The views at this camp are STUNNING! It feels like there is no one else for miles around. The camp is gorgeous, focusing on a personal experience. I think this camp would be aimed at second-time safari goers who want to get away from mainstream safaris. If you have the budget then this camp is for you." "Saruni Lodge was definitely a good choice. Pleasant surprise. We were moved there when Intrepids Lodge was flooded out. Our pilot that flew us up there, took us low over the Ewaso River so we could see the extend of the flood damage .... it was amazing. "